Our FREE Cagle.com site is the face of editorial cartooning to the world! We need your support! Our editorial cartooning profession is threatened like never before! Newspapers, our traditional clients, continue their steep decline. Advertising revenue on the Web has crashed everywhere (except at Google and Facebook) as the internet hasn’t proven to be a paying market for editorial cartoonists. We haven’t put up a paywall at Cagle.com – our site remains free, because of our Heroes! 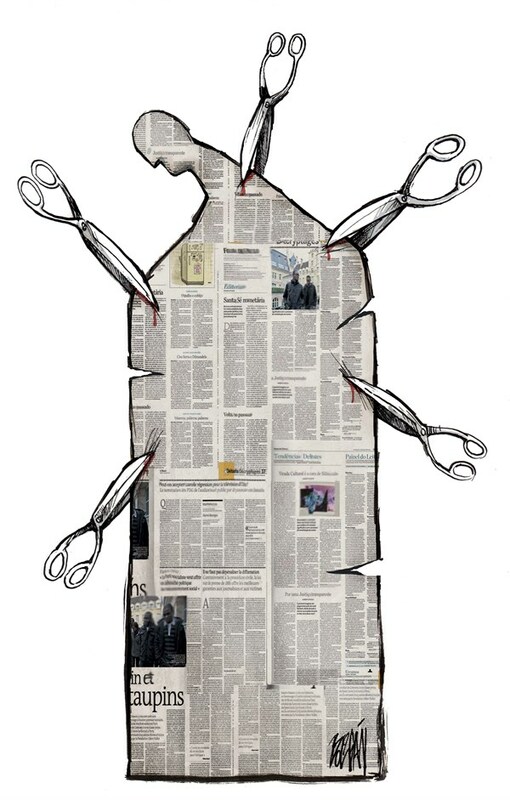 Newspaper Cuts by Cagle Cartoonist Angel Boligán. If you love our art form – if you appreciate images that can make you laugh or cry, that can speak truth to power, and can bring crowds to protest in the streets around the world – then support Cagle.com! Readers’ support has kept our site up and running in these difficult times! Cagle.com is available now, and in the future, only because of your continuing support! As a Cagle.com “Hero” you’ll get a special weekly Heroes email newsletter with our favorite cartoon picks of the week – and some occasional cartoon surprises, only for Heroes. E-mail us at [email protected] with any questions! Make a monthly contribution for our long-term support, or make a one time contribution when you choose to do so. Our future is in your hands! Many thanks! Write to [email protected] with any questions! Cagle.com is owned and operated by Cagle Cartoons, Inc. which pays royalties to the cartoonists. Your contributions defray our expenses and keep Cagle.com running, but do not constitute tax-deductible charitable donations. Your support makes Cagle.com possible! Please use the button below to make a one time contribution! If you have questions or concerns, email us at [email protected]. We love our Cagle Heroes! If you want to contribute but do not want to use a credit card or PayPal, you can mail us a check. Cagle.com, originally known as Daryl Cagle's Professional Cartoonists Index, has been the top internet destination for editorial and political cartoons since 1996. We host archives for hundreds of the top cartoonists from all over the globe. With close to 200,000 cartoons, we are the single largest resource for contemporary editorial cartoons.